There are endless ways to play with playdough. And I love that about it. 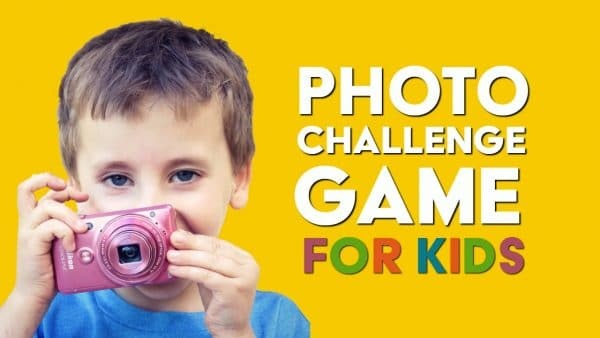 It’s great for free play, because it encourages kids to create freely without any rules. But on the days when playdough is just boring for them I have a cure for it. I guarantee, it will make your kids ask for more play time with playdough. 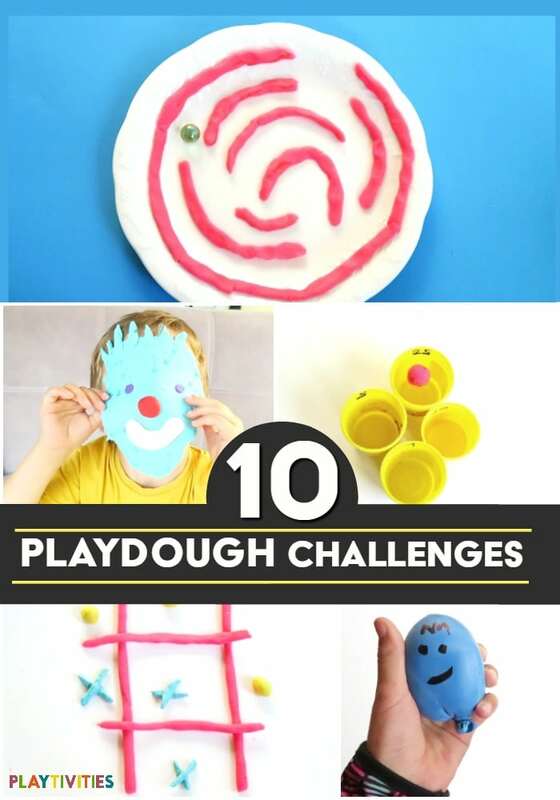 We came up with super duper fun playdough challenges for kids. They are simple (well, maybe not that simple), but definitely entertaining and will keep your kids busy for a quite a while. 1. Build a structure using playdough and pasta as tall as you. Stand next to it and ask someone to take a picture of you and your astonishing architectural miracle. 2. Write your name with playdough. Too easy? Roll a long line of playdough and try to sign your signature with it. 3. Make yourself a playdough mask and put it on your face so you can show it off (and maybe scare someone). 4. Make a playdough squishy. Fill a balloon with playdough, tie it up and draw a funny face on it with a marker. 5. Have a playdough pin pong race. Line up empty playdough containers (or plastic cups) in a triangle shape and write numbers on the cups: 1, 3, 5, 10, 25. These are you scores .You have 10 chances to get the highest score poşible. 6. Cover your whole hand with playdough. 7. Ask your play buddy to hide 10 small objects inside the playdough and try to find them and dig them out in one minute. 8. 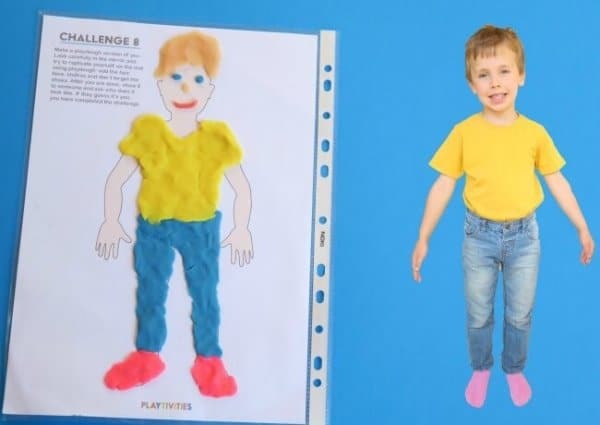 Make a playdough version of you. Print a playdough mat provided in the files. Look carefully in the mirror and try to replicate yourself on the mat using playdough: add the hair, face, clothes and don’t forget the shoes. After you are done, show it to someone and ask who does it look like. If they fueş it’s you , you have completed the challenge. looks pretty similar, doesn’t it? 9. Build a playdough maze on a plate and roll a marble through it. 10. Create a playdough TIC TAC TOE. Build 4 long straight lines. Put two of them vertically and top the other two horizontally. Then, make 5 ”x” and 5 “o” shapes. Invite someone to play a game with you. Leave your name and your best email and I will send you these files (including a FREE template needed for Challenge Nr. 8) instantly. This is week 5 of our Weekend Camp at Home where we try to occupy kids with fun and hopefully independent play activities on the weekends. So you can do your stuff. Want to join us? Come and join our Activity Camp Facebook group community with likeminded folks who want to create a fun and memorable childhood for their kids.